Mortal Kombat creator Ed Boon walked out on stage at this year's Game Awards to announce a winner of a select category and instead presented us with the surprise reveal of Mortal Kombat 11 - the next entry in the long-running bloody and brutal fighting series by NetherRealm Studios and Warner Bros. The game is arriving worldwide on 23rd April. While no platforms were specifically mentioned by Boon, at the end of the announcement trailer the Switch logo was present (we've grabbed a screenshot for you below). The game's official Twitter account makes mention of the Nintendo Switch release as well. 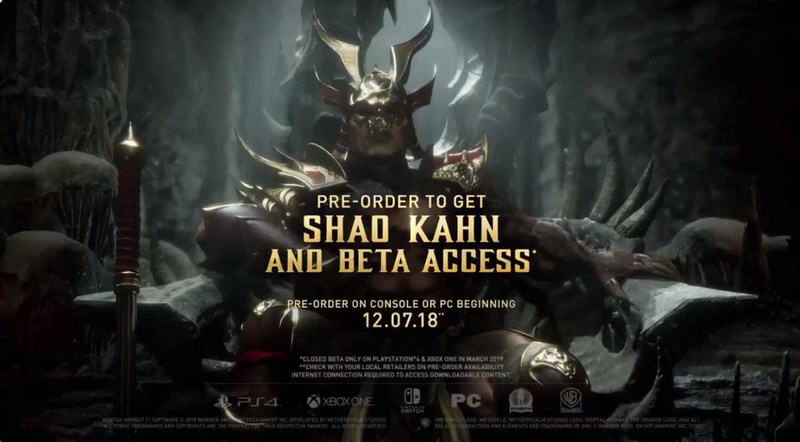 This is a rather big surprise considering a Mortal Kombat game hasn't appeared on a Nintendo platform since the 2007 DS release. ar Leveln mehr, und dann gleich zweimal auf Switch und 3DS... Warum kein komplett neues Captain Toad?! ?